Last week I finished a really busy stretch of almost a month straight of work without any time off (not recommended!) On Friday, my first day off, I then found myself having a mini panic attack on the way to an acupuncture appointment (I get the irony here, and it was also my birthday). Note to self: never let this level of busy-ness happen again. I think you can understand why I couldn’t even finish this post last week - I was losing my mind! I’m not totally sure how I’ve made it through this spring, but I know that I wouldn’t have without some habits and tactics that I regularly employ as part of my life. I was also partially inspired to write this post by Sara Campbell of Upbeat Piano Teachers - her video last week about lifehacks for piano teachers has lots of helpful hints about organization for private music lesson teachers. 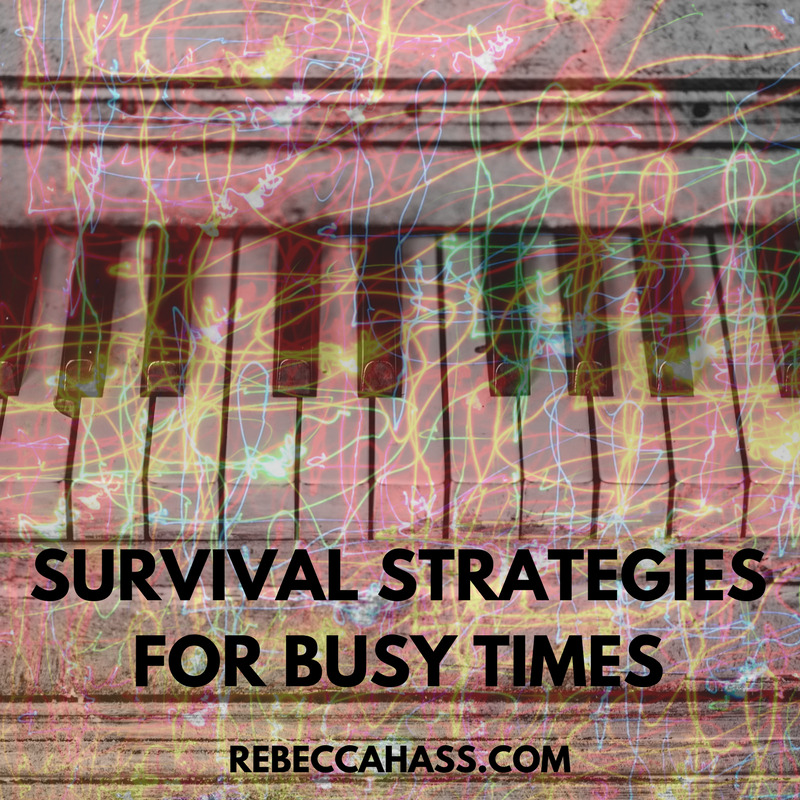 Here are my favorite survival strategies for musicians, self-employed people, or really any busy people! Most of the time I don’t have time to cook a meal on weekdays (or I get home late and don’t want to), so I cook food for the week ahead of time, and make sure that I have filling snacks on hand. My go-tos are nuts, crackers or plantain chips with sunflower seed butter, hummus and veggies, hard-boiled eggs, or smoked salmon. For me, this includes a bag of almonds, chocolate, energy bars (or other snacks), mints, ginger candies, a few bags of tea (in my current rotation: ginger, kava stress relief, tulsi, and chai rooibos), a relaxing essential oil blend (this is my favorite right now), and at least one beverage at all times! The busier I am, the more diffused my energy gets, and I become very likely to distract myself in various ways. I use the Self-Control app to block Facebook and other distracting websites during the day, and the Pomodoro Method (using Marinaratimer.com) to work in short bursts at my computer - 25 minutes of work, followed by a 5 minute break, cycled as many times as I need. I don’t use this when practicing or composing, because longer, freer blocks of time work better. You don’t need any fancy cushions or big commitments, just a few minutes, lungs, and your own mind. Instead of getting out your phone while you’re in line, waiting for someone, or stuck in traffic, take that time to breathe. Even a few minutes makes a big difference, helps with the aforementioned focus, and helps those of us who are prone to anxiety. Sometimes I meditate by doing a normal activity (walking to work, making lunch) a little more slowly and focusing on breathing while I do it. This only takes a little bit longer than it usually would, and refusing to rush is great for my mental health! This is completely non-negotiable for me, first because I need it to maintain my mental health, but also because that 20-30 minute walk that it seems like I don’t have time for, pays off in terms of focusing my mind during the day, and also gives me some of my best ideas. It’s worth it, even if you only have time for a shorter walk! In the evening, take a few minutes to remember what you need to bring with you the next morning/day, and make a list. Better yet, put extra things you need right in front of the door, so that you can’t forget them. This way you won’t wake up in the middle of the night and wonder if you’re remembering everything you need, costing you sleep, and even more of your sanity. I know that it sounds counter-intuitive to be telling yourself to do less work when you’re super busy and working more, but shorter lists help you prioritize what most needs to get done. You’ll probably actually achieve the same amount, and you’ll feel more in control and better about yourself because you get to the end of the list. I’m not usually very good at doing this, but I’ve been trying it this week, and I’m getting the essentials done, in a more relaxed fashion. I know what you’re thinking - you don’t have time for that. But I really mean micro-: a tiny pocket of time, whatever you have - it could be 5 minutes or 10 to go outside for a little stroll, or just to breathe, whatever refreshes you. People who take breaks are more productive! When I’m working all of the time, I start to convince myself that there is only one rule that governs my life, and that rule is “NO FUN EVER”, because I don’t have any time. That’s usually not even true, though, I just have convinced myself that it is. Just a little treat like buying a kombucha or taking 10 minutes longer at lunch to read something fun makes me feel like my life is more luxurious. So I’m still living in survival mode for a little longer, because this weekend is very busy, but just after that is Memorial Day weekend, when I will have a glorious 4 days off in a row, and then summer, when I have WEEKENDS like a normal person! We’re going to make it, teachers, busy people, and everyone! What are your favorite survival strategies that help you get through busy periods of time? Share in the comments!